Sean McDermott scored all 21 of his points on 3-pointers. 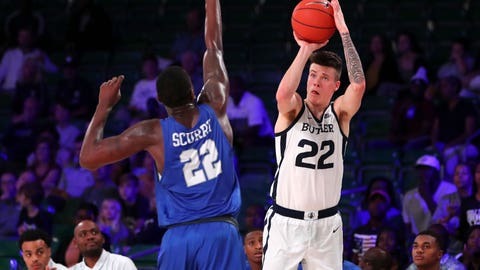 PARADISE ISLAND, Bahamas — Sean McDermott scored 21 points by tying the tournament record of seven 3-pointers, part of Butler’s Atlantis-record 16 made threes in an 84-53 win over Middle Tennessee in Thursday’s consolation bracket at the Battle 4 Atlantis. McDermott’s seven threes tied a record set by Wisconsin’s D’Mitrik Trice against Oklahoma earlier Thursday. The Bulldogs (4-1) also went 16 of 35 from behind the arc, surpassing the previous mark of 15 3s set by Massachusetts in 2011. Paul Jorgensen also scored 21 points as Butler shot 52 percent in a big offensive output following its first-round loss to Dayton. The Bulldogs built a 44-27 halftime lead and never looked back. James Hawthorne scored 11 points to lead the Blue Raiders (3-3), who shot 32 percent and committed 20 turnovers. Butler will face Florida in Friday’s fifth-place game. Middle Tennessee will face Stanford in the seventh-place game.